Today, I'm featuring an image of my great-great-grandparents, William R. Benton and his wife Adella Fowler Benton. They were born and raised in the town of Livonia, New York. Before the Civil War, William had gone to Illinois, where he worked as a school teacher. When the war broke out, he volunteered in the 62nd Illinois Infantry and was at the Siege of Vicksburg. He was captured at Holly Springs, but he was later paroled and rejoined his unit. He was weakened by his imprisonment and suffered complications for the rest of his life. After the war, he returned to New York State and worked for a time with his brother at his drug store. He married Adella and after a few years, he homesteaded a piece of land in Pottawatomie County, Kansas. There he also taught in the schools and was twice elected to the Kansas State Legislature. They had four daughters and two sons, although one daughter died very young. Eventually, his health again weakening, they retired to a suburb of Topeka, Kansas, where William died in 1894 at the age of 57. Adella lived a few more years, but died in 1899 at the age of 53 of a flu she caught while caring for her ill sister-in-law and their family. I believe this photo was most likely taken after the family moved near Topeka. I think the backdrops are fascinating, particularly the fireplace and mantle items. Look closely and see if you can tell if they're real or not. The backdrop certainly isn't real, but great photo nonetheless. Is it a tintype? I think they are a very handsome couple. The style of his beard tells me this was taken in the 1860s. They both look too young here to be in their 50's, so I'm thinking this was taken in Illinois. Do you know where they were in Illinois? Is there a photography shop logo anywhere? This is a beautiful image (despite the background). Elizabeth, yes, it's a tintype. 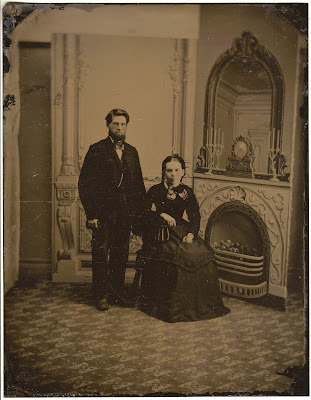 Mary, you may be right about the photo, but they weren't married until 1866 and after that point they lived in New York State until 1872 when they moved to Kansas. What a beautiful picture! Nice Lincoln-beard. I guess both are in their 30s so I would say the picture dates from the mid 1870s. Late 1860's or early 1870's in 1871 she would have been 25 years old. She is showing her ears and has what appear to be sausage curls and tassles on her dress.